Join us at the park improvement projects listed below and help us protect and restore local natural areas. New projects will be listed periodically. We invite you to join THPRD in the protection and restoration of natural areas in our community. Below is a list of habitat and trail improvement events where we need volunteer help. New events will be added periodically, so check back for updated information or subscribe to the THPRD Nature & Trails volunteer newsletter. We recommend that participants wear long pants, old tennis shoes or hiking boots and weather appropriate clothing. Tools and gloves will be provided, but feel free to bring heavy-duty work gloves, loppers and a shovel. Please bring reusable water bottles; this simple step will assist us in our efforts to reduce waste. If you have questions about an event, contact Melissa Marcum, Nature & Trails Volunteer Coordinator, at 503-619-3941. Note: Pre-registration is required for all events listed. Join us as we continue to remove English ivy and Himalayan blackberry from the natural areas of Fir Grove Park. Please bring a re-usable water bottle to drink from throughout the event. Tools, gloves, snacks and a water cooler will be provided! Join us as we continue to remove English ivy and Himalayan blackberry from the forested portions of NE Park. Please bring a re-usable water bottle to drink from throughout the event. Tools, gloves, snacks and a water cooler will be provided! Be a part of the change taking place at Willow Creek Greenway by joining forces with the Five Oaks/Triple Creek Neighborhood Association and Tualatin Hills Park & Recreation District to remove English ivy, Himalayan blackberry and invasive trees from the south side of the stream. These efforts will be complemented by contracted crews who will be working on large-scale Himalayan blackberry removal along the north side of the stream. Please bring a re-usable water bottle to drink from throughout the project. Tools, work gloves, snacks and a water cooler will be provided! Celebrate National Trails Day at Tualatin Hills Nature Park! Join us as we improve many of the mucky trails that run throughout the natural areas of the Tualatin Hills Nature Park. Please bring a re-usable water bottle to drink from throughout the day. Tools, snacks and a water cooler will be provided! Join New Seasons as they partner with Tualatin Hills Park & Recreation District to improve the trails at Cooper Mountain Nature Park. New Seasons will provide coffee and donuts for the project. Please bring a re-usable water bottle to drink from throughout the event. Tools, gloves, snacks and a water cooler will be provided. Join forces with the Friends of Tualatin Hills Nature Park and Tualatin Hills Park & Recreation District for the Friend's annual service project and potluck. Efforts this year will focus on sprucing up the demonstration gardens surrounding the Nature Center, as well as some habitat restoration in the park. Activities could include weeding, mulching, pruning, litter pickup, blackberry removal and ivy removal. Please bring a re-usable water bottle to drink from throughout the day. Tools, gloves and snacks will be provided. All volunteers are welcome to attend the potluck lunch at the Nature Center, immediately following the project. 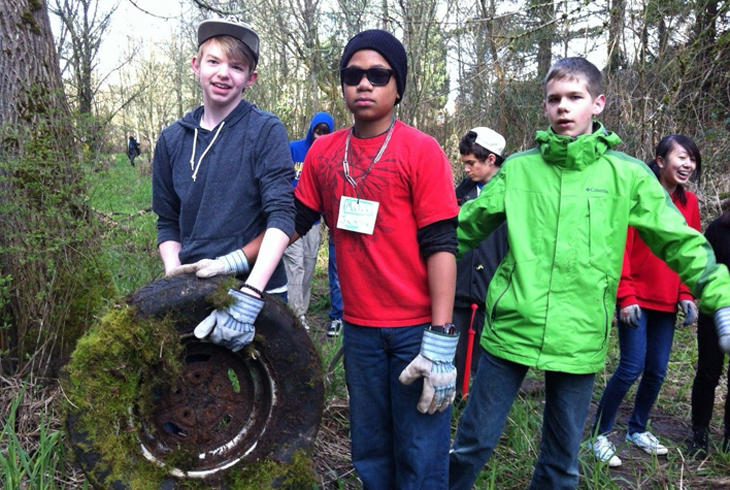 Join New Seasons as they partner with Tualatin Hills Park & Recreation District to restore the natural areas of Barrows Park. Activities will focus on removing trash from the stream corridor. New Seasons will provide coffee and donuts before the start of the project, between 8:30 - 9 a.m. Please bring a re-usable water bottle to drink from throughout the event. Tools, gloves, snacks and a water cooler will be provided.